Stone type: Coarse-grained, massive yellow sandstone. 39.4cm (15.5'') in height, 29.8cm to 27.9cm (11.25'' to 11'') in width, and 20.3cm to 19.1cm (8'' to 7.5'') in depth. Upper part of Cross Shaft, dated to late tenth century to early eleventh century. The face is surrounded by thick double roll mouldings. 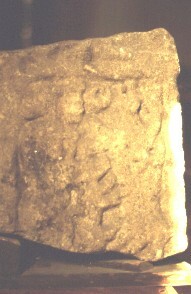 On the left there is a standing figure with head in profile. One of his hands seems to be attached to a small quadruped. This creature's front feet and muzzle are touching the body of a figure on the right. This figure is frontal and he has a club or a horn in his right hand. Between the heads of the two figures there is a roughly round object with two holes in it. It is thought that this could represent a Viking Ragnarök scene, or possibly Christ.